Our Meishan Pig breeding program is the center of our farm’s focus . You will find lots of ads for Meishan Piglets for sale on the Internet. But you wont find the strategy behind breeding those piglets. 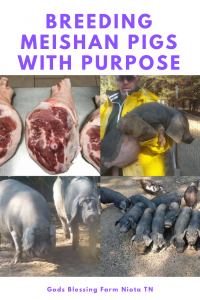 At Gods Blessing Farm LLC we are constantly working to preserve an adequately broad genetic base of the Meishan Pig breed. But this effort must also assure that our Meishan Pigs must conform to breed standards and performance goals.We believe that you learn more about a breeder from the pigs they cull than the pigs they sell. It is our strategy that we never completely remove a bloodline from our herd. But we are willing to aggressively cull individual animals.Those animals go into service as meat barrows or pets. We do not sell inferior stock as “pure but unregistered” . Since we began breeding Meishan Pigs in 2015 less than 33% of the Meishan piglets farrowed have been sold as breeders.. We have culled more total Meishan piglets and Meishan Pig adults , from more bloodlines, than any other Meishan Pig breeder even owns. We always adhere to the sage advice “breed the best and eat the rest”. 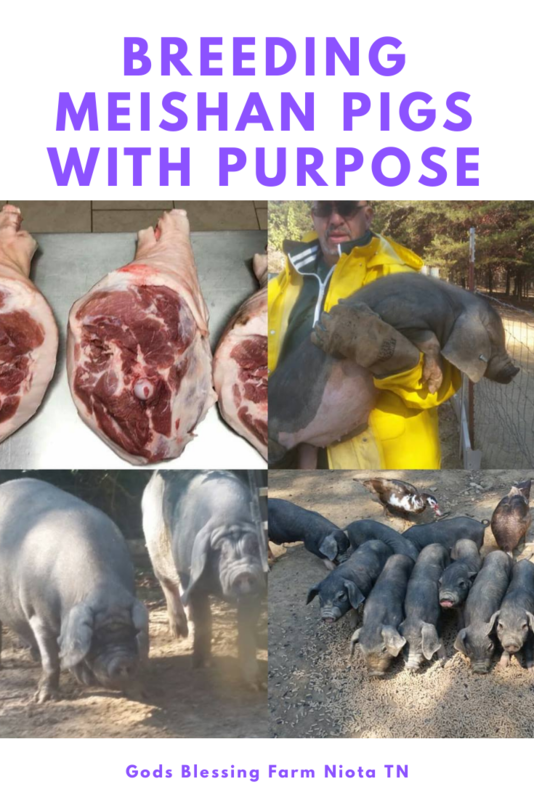 It was a significant commitment in opportunity cost but it will allow us to more quickly reach our breeding objectives and in the long run will benefit the entire breed and those farms that choose us as their source for Meishan Pig genetics. Genetic integrity is not just purity of stock.It is also documenting the genetic diversity of each breeding animal . Being the only Meishan Pig breeder with pure examples all three research herd bloodlines assures of that diversity. Because we have all three of the bloodlines( USDA, University of Illinois and Iowa State) we offer the greatest opportunity for genetic diversity. The three research herds were completely isolated from each other for over 25 years and countless generations. The unique genetic profiles of the different research herd animals were documented in a USDA research paper on genetic drift (Blackburn et al 2014). Our USDA line Meishan Hogs were obtained directly from the USDA Meat Animal Research Center in Clay Nebraska. Our University of Illinois Meishan Pig bloodlines came directly from the campus in Champagne. They were the last descendants of the original research herd there. We are the only independent breeder on record to receive breeding stock from these two facilities.Only Gods Blessing Farm and those breeders who purchased stock from us (or from our customers) have these Meishan Pig bloodlines. Founding Member of the A.M.B.A. These bloodlines are critical to maintain a genetically sustainable Meishan herd in North America. 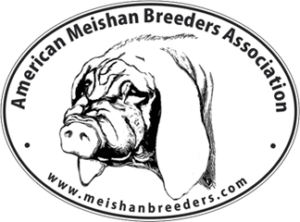 We are also proud to be deeply involved in the American Meishan Breeders Association. The A.M.B.A. 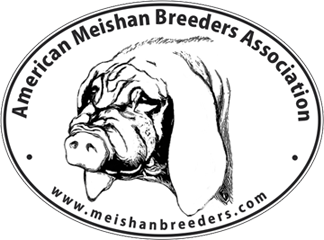 was incorporated in 2016 to develop an on line pedigree data base that will allow breeders to make informed breeding decisions as part of the effort to establish a genetically sustainable herd of Meishan pigs in North America.All of our nucleus herd of Meishans are registered in that data base. We plan to undertake a breeding program in 2019 to broaden and develop the Illinois line of Meishan Pigs. Through selective line breeding and outcrossing we will be ale to offer extremely high percentage Illinois bloodline stock in 2019. The USDA line will be both be crossed and maintained pure. We will continue to work to broaden the depth of the genetic base of the breed. In the future we will be announcing plans to recover and reinvigorate the Iowa State lines of this amazing breed. We have culled our original Iowa State breeding stock due to poor performance . But we have retained offspring for genetic diversity. Once the Illinois project is well under way we will have some exciting announcements about our plans for the Iowa State bloodlines. We invite you to join with us in this effort to preserve and document this rarest of livestock pigs.